This is kind of an oddball piece. I found it while going through some old comic book art files this past week. 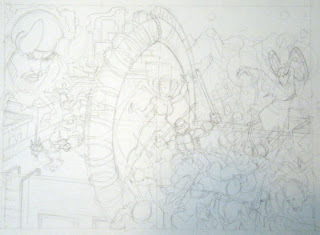 It's a loose pencil drawing, obviously by Kevin Eastman, drawn on illustration board. -->> .. i only have the later FIRST books .. not volume 1. This looks like it would have been a wrap - around cover. Was it tossed around having wrap - arounds for those volumes ?! Well, it definitely had Cerebus and Renet in it, so it should have something to do with issue 8, no? Was it tossed around having wrap - arounds for those volumes ?!"